One tradition that we did half-heartedly last year and (hopefully) whole-heartedly this year was to choose a patron saint and guiding Scripture verse for each family member as well as for the family overall. We used the saint’s name generator and the random Bible verse generator (just press reload). Without further ado, here are our saints and verses for 2012. My internet roots are found in two yahoogroups I used to run– Everyday Waldorf and Feasts and Festivals. One of my goals this year is to bring a good bit of that content to this blog. 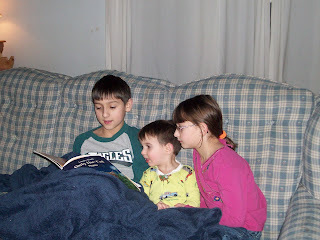 Yesterday, Angela asked if my older kids ever read to my little ones. Then last night, I found this! Michael reading Only the Cat Saw by Ashley Wolff to Daniel, while Katie Grace looked on. I think my kids miss their Saturday Daddy. Two weeks ago, there was one wedding. Then last week, there were two weddings. This weekend, there was one more wedding. And with weddings come Friday night rehearsals and Saturday night receptions. I’m so tired of everyone getting married. No one else can get married. Today is the tenth anniversary of our losing our first little baby, Mary Elizabeth. It’s good to know we have a little saint in heaven, interceding for us. We used to have family meetings, and the kids missed it a lot. Tonight we had the first family meeting in a long time. * Michael is worried because the occupational therapist “gets angry” when he isn’t at school by 8:30 for OT on Thursdays. (Note, school doesn’t actually start til 8:45. DH is going in early with Michael on Thursday to find out what the heck is going on. Or maybe I will. Bwahahaha!